How do I find MMD resources? Where can I download new models for MMD? How will I know if this resource is “original”? I’m back from the dead, guys! 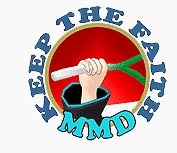 Let’s go MMD resources hunting! But before that, what does a ‘resource’ mean? To put in much simpler terms, a resource is basically something that we use. Applying that definition, an MMD resource would mean that it’s something that we use for MMD, such as a model, stage/accessory, effect, motion and pose data. I’ll let you in on something: I’m an absolute model collector. I love collecting models regardless of whether or not the model is too heavy on my poor little laptop to run. I mostly like collecting models of characters from my favorite anime and games. Sometimes a little bit of Vocaloids and UTAU’s here and there. Of course a collector would have thought of different ways to expand their collection, right? As we all know, DeviantART (hence forth abbreviated as DA from now on) is an online art community that caters to a wide range of art types. For most part, you won’t find an MMD model made from scratch here, nevertheless, there are chances that you will find models that are edited quite nicely, and it’s really simple to get them, too. 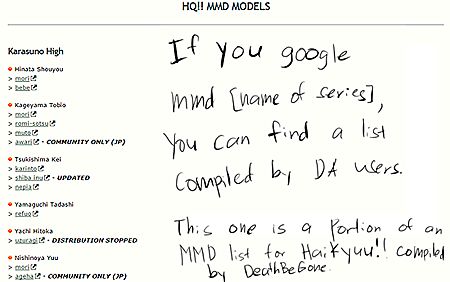 All you have to do is search “MMD [name of series or character]” and chances are you’ll find what you’re looking for. What’s good about looking for models in DA is that the range of models being made is really wide. You can find characters from non-Japanese series like cartoons or TV dramas. Sometimes you’ll see something along the lines of “Model Showcase” or “Model Series”; those usually contain a picture of a Japanese model and its specifications such as number of bones, joints and expressions; as well as basic rules like permissions for editing, R18 content, and shounen/shoujo ai. For accessories and stages just type in “MMD [name of item/stage]. There are times that you will come across some results like lists of models that lead you to different links of downloads. Don’t be afraid to click on those! Lists are very helpful in looking for Japanese models. You can also ‘save’ that list by adding it to your favourites. I know there is an English version of the websites, but switching the website to Japanese will give you more results in your searches since some upload videos that are somewhat ‘hidden’ in the English version. To switch to Japanese, go to the bottom of the page and change the country to Japan and the language to “日本語”. Don’t worry if you don’t understand anything, you’ll only be using one feature to make your way around them: the trusty search bar. 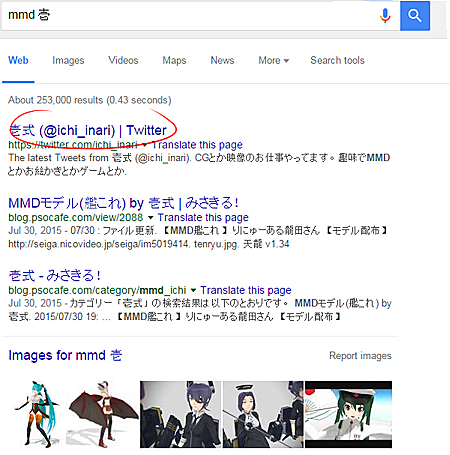 Type in “MMD [name of series in Japanese]”. Remember to add the spaces in between MMD and the name because that divides your search into two tags, MMD and the series you’re looking for. This makes the results even more broad while still putting the MMD-related results first. 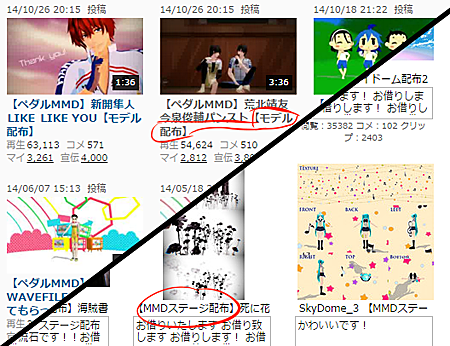 Some videos have specific tags for popular series such as “APヘタリアMMD” for Hetalia,　”進撃のMMD” for Attack on Titan, “MMDギアス” for Code Geass and “MMD艦これ” for Kantai Collection. There are a lot more tags similar to them, but if you are not sure of what MMD tag is used for a specific series, or if the tags give you less results, it’s best to stick with the MMD-[space]-series format. For stages and accessories, type in “MMD [name of item in Japanese]”. Add ステージ in the searches if you’re looking for a stage. What you want to look for is the one with a title that says “モデル配布” which means model distribution or “ステージ配布” which means stage distribution. Sometimes accessories don’t have these in the title, but one thing that gives them away is that the thumbnail shows the item itself, or a model is showcasing the item. Mikudance.info and CitruSmoothie served as MMD model databases for the Western MMD community. However both of these sites have shut down, which makes them the hardest to navigate. All hope is not lost, they are still useful in some way. You can find old copies of the websites using the Wayback Machine by pasting their url and navigate from there. PLEASE DO TAKE NOTE THAT MOST OF THE LINKS ON THESE LISTS ARE DEAD. I SUGGEST NOT CLICKING THEM. If you want to find a model that you want, look at the model’s info, then get the modeler’s name and google “mmd [name of modeler]” Usually that will lead you to the modeler’s Twitter, NND account or Bowlroll, where there might be an updated version of the model you’re looking for. Let’s use the model shown above as an example. 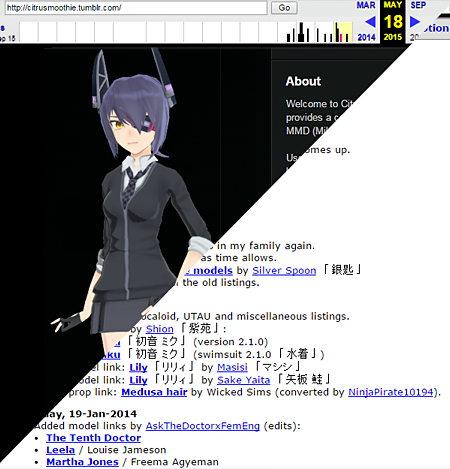 That model is Tenryuu from Kantai Collection, made by Isshiki (壱). Looking for pose and motion data is easy in DA. Just search for “MMD pose data” and you will see a lot of them made by different users. For motion data, there are a ton of lists that people keep that lead to reliable sources. A good example of this is MMD-Nay-PMD’s Motion Data Index. Just type in “[name of song] motion data” (for YouTube) and “[name of song in Japanese] モーション” and you should be able to find what you’re looking for. Okay, this is what I mean by “original resource”. You see, I’ve noticed that YouTube videos that include motion download links which are not from the original maker. NOTE: This mostly tells about how to tell if a certain motion data is original or not, since motion data is what I usually notice that’s illegally distributed. However some of these points apply to models and other resources. The video description contains nothing but the download link to the motion. Usually they’re MediaFire links. Unless you can tell that the owner uploaded the motion there (like westernmade motion like memes and vines), DO NOT CLICK THAT LINK. The motion does not include a ReadMe if you download it. Yes, I have committed this mistake in my early days of Miku-Miku-Dancing. Luckily, I’ve been able to track down the original motion downloads and decided to keep the other ones for reference. Making comparisons with the ‘original’ motion data package, there is no ReadMe attached to it. I’ll admit that my collection of effects is not very wide. Most of my pictures are either rendered raw or edited in Photoshop; so I only know effects by looking at other people’s work on DeviantART. It becomes very helpful when people say what effects they use. What I usually do is google them or do a search on DeviantART by typing “mme [name of effect]”. 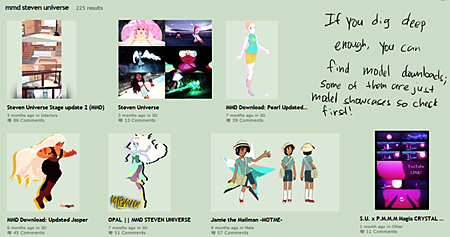 Most DeviantART results have a list of downloads that lead to the original download link so don’t worry about it. I don’t trust YouTube download links so much since most of them have the effects compiled and uploaded somewhere else. It is convenient when you think about it, but the fact that they lead the viewer somewhere else other than the original is why I don’t trust them so much. So what do I do when I see an effect that I like? Simple. I google it. Remember to only download items only from sources you can trust; not just for the creator’s sake but for your own. Sometimes file hosting sites have malicious ads that they don’t know about when they host themselves… so stay safe! Passwords are tricky, but they serve as a test if someone wants a model and can prove how “worthy” they are to download them. I’m not going to directly tell you what was each and every password for every model I have nor will I tell you what the hints are; that’d be against the rules! Rather, I’ll show you how I figure out passwords. Locate the password hint. Most of them are the sentence after パス. Go on and copy + paste that on Google Translate. Think! Think! Think! Since Google Translate isn’t very good at translating Japanese (or any other language) to English, think what could that sentence mean. For example, “Meeting place first” could mean “The place they first met”. Think of the broken translation as a riddle. Password hints sometimes include puns and references that only apply in Japanese, so doing research and thinking outside the box is key. List all the possible passwords. Chances are, you might have several answers to that riddle… and several combinations of letters and numbers. Before doing anything else, list them down by typing them on a word processor like Notepad. Try them out one by one. If you haven’t gotten it right, don’t give up! The answer could be much simpler than you think. If you got it right, congratulations! Enjoy your newly downloaded model! I tried DeviantArt. I downloaded some models, but when I went to MMD and hit “Load”, there was no models! I don’t know if I had to convert and I don’t know HOW to convert. Models on dA come in archived form. Did you unpack them before trying to load? 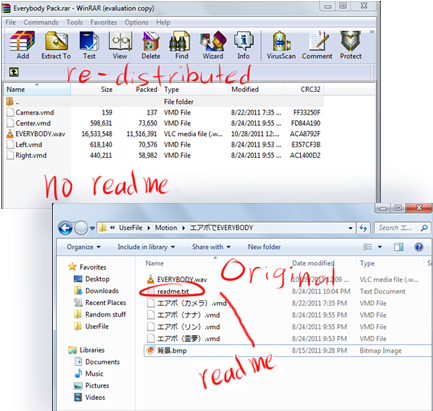 B) yeah, only bone structure is visible…..
What files do you see when opening the folder you load a .pmx file from? hi! i want to ask (i’m a newbie). lately, i have downloaded new models and i tried to load them in MMD. but when it loaded, it only appear their bones, not physical figure model. i confused, it usually appears their figure w/ bones. A) Do you mean that there are models that look normally when you load them, and then there are those that don’t? Then there might be a problem with those particular models and not with your MMD. Try to supply an address from where you’ve downloaded some of those problematic models and we could try to inspect them for ourselves. B) Do you mean exactly bone structure and *nothing* else is visible or there’s a white silhouette around those bones (it may be not obvious on white background but if you additionally load some stage into MMD the difference will be noticeable)? If the latter, then you might have somehow lost model’s texture files when unpacking it from the archive. They must be placed in the same folder as the main model file.